Walking is a brilliant exercise. It can help to keep you healthy and control your weight, as well as giving you time to enjoy with friends and family, and the opportunity to explore your local area. The best news is it's free! Almost everyone can do it, whenever they like. You don’t need specialist equipment or training and it can easily fit into your daily life. There are many places to walk in Gloucestershire, be it through the countryside or some of its historic towns and cities, there's sure to be somewhere for everyone. 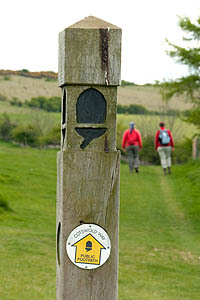 You can download maps of walks in the Cotswolds area of outstanding natural beauty. There are a great variety for people of all abilities to explore. The Cheltenham rambling club offers walks of varying lengths in Gloucestershire for all ages and abilities and always welcomes new members. Walk Well Cheltenham is a programme which aims to encourage people to be more active through walking.